The Trump administration’s tactic of separating parents from their children to deter illegal border crossings is horrific, cruel and undermines the United States’ record as a defender of human rights. People fleeing violence and poverty deserve our nation’s compassion, not a demonstration of its cruelty. Yet the U.S. government’s policy of increasing prosecutions of the number of people who cross the border illegally is the very definition of inhumane. The result is that parents, including asylum seekers, are separated from their children. America cannot preach the importance of treating others with dignity in its dealings abroad — acting as a defender of human rights at the United Nations, for example — while simultaneously ripping children from their parents’ arms in California and Texas. Continuing this practice threatens the United States’ standing on the global stage and runs counter to the values we espouse as a nation. The Trump administration’s plan to start criminally prosecuting 100 percent of people who cross the border illegally — a misdemeanor on the first offense — is a tactic specifically aimed at jailing parents and separating them from their children. Yet separating families is bound to inflict psychological harm not just on parents, but also the vulnerable children in their care. Already, about 700 children were reportedly taken from their parents at the border between October and April as part of the Trump administration’s crackdown on illegal crossings. While official numbers are not yet available for May, people working on immigration cases have reported a sharp uptick in family separations since Attorney General Jeff Sessions announced the administration’s new zero-tolerance policy May 7. Misdemeanor offenses often don’t result in any jail time in the United States. But officials in the Trump administration have decided to send a message that these migrants will be treated differently, even those who show up seeking the protection of political asylum. These asylum-seekers are typically people who fear returning to their home country due to gang violence or other persecution. They come to the United States as an act of desperation, hoping to spare their children from terrible fates. They should not be thrown in jail and separated from the very children they are trying to save. They should not have to wonder in agony where their children are or how they are doing, as a Congolese woman seeking asylum said she did after being separated from her 6-year-old daughter at a port of entry in California last fall. The pair were reunited after four months, but only after the American Civil Liberties Union filed a lawsuit. This treatment goes against U.N. 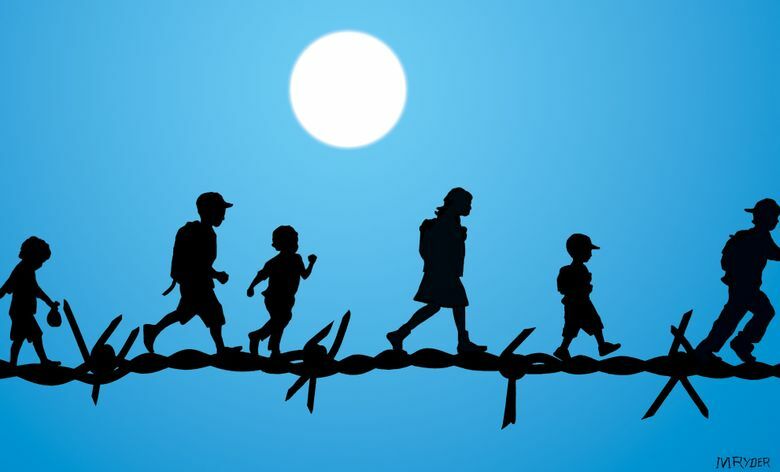 Refugee Agency guidelines that say children have the right to remain united with their parents, and that detention of asylum-seekers must be avoided. However, no one, not even someone who illegally crosses the border for other reasons, deserves to be parted from his or her children and sent back home without them. According to the Houston Chronicle, that’s what happened to Esteban Pastor, a Guatemalan who was deported in October without knowing the whereabouts of his 18-month-old son. This debate is distinct from the question of whether families who enter the United States illegally should be allowed to stay. For many, deportation may be the outcome. But in the past, most immigration violations have been treated as civil offenses that didn’t require splitting up families while cases were underway. Parents and children who illegally crossed the border were typically held together, or released to await the result of their asylum cases or deportation proceedings. Even in cases where deportation is deemed necessary, the U.S. should be sending families back whole, not tearing them into pieces. The United States must take steps to once again ensure that families awaiting deportation proceedings can stay together or at least be quickly reunited. To behave otherwise defies our country’s reputation as a pillar of freedom and democracy around the world. Adopting this new standard of callousness will erode our influence across the globe.